The Internet of Everything is coming. The Internet is expanding into enterprise assets and consumer items such as cars and televisions. Very many electronics devices needs to be designed for this in mind. The Internet of Things (IoT) will evolve into the Web of Things, increasing the coordination between things in the real world and their counterparts on the Web. Gartner suggests that the “the smart machine era will be the most disruptive in the history of IT.” Intelligent systems and assistive devices will advance smart healthcare. Software-defined anything (SDx) is coming more into use. It means that many proprietary systems are being replaced with commonly available standard computer hardware and software running in them. PC market: ABANDON HOPE all ye who enter here. Vendor consolidation ‘inevitable’. Even Intel had to finally admit this that the Wintel grip which has served it and Microsoft so well over the past decades is waning, with Android and iOS coming to the fore through smartphones and tabs. The market conversion to tablets means that consumers and businesses are sweating existing PC assets longer. Tablets to Make Up Half of 2014 PC Market. The Rise, Fall, and Rise of Electronics Kits article mentions that many older engineers first became interested in electronics through hobbies in their youth—assembling kits, participating in amateur radio, or engaging in other experiments. The 1970s and 1980s were great times for electronics hobbyists. But whenever it seems that there’s nothing left for the hobbyist, a new motif arises. The Raspberry Pi has become a best seller, as has a similar experimental board, the Arduino microcontroller. A great number of sensors, actuators, cameras, and the like have quickly become available for both. Innovative applications abound in such domains as home automation and robotics. So it seems that now there is much greater capacity for creativity in hobby electronics then there ever was. Online courses demand new technological approaches. These days, students from all corners of the world can sign up for online classes to study everything from computer science, digital signal processing, and machine learning to European history, psychology, and astronomy — and all for free. E-Waste: Lack of Info Plagues Efforts to Reduce E-Waste article tells that creation of trade codes is necessary to track used electronics products according to a recent study concerning the waste from growing quantities of used electronics devices—including TVs, mobile phones and computers. High levels of electronic waste are being sent to Africa and Asia under false pretenses.” StEP estimates worldwide e-waste to increase by 33 percent from 50 million tons in 2012 to 65 million tons by 2017. China and the U.S. lead the world as top producers of e-waste. America produces about 65 pounds of e-waste per person every year. There will be aims to reduce the waste, for example project like standardizing mobile phone chargers and laptop power supplies. Spray-on solar cells have been a dream for a decade, but now the IBM Canada’s Research and Development Centre — a consortium of seven universities including the University of Toronto where this work was done — may have found the key to make spray-on solar cells a reality. The secret ingredient, according to Illlan Kramer, an IBM employee who works as a post-doctoral fellow in professor Ted Sargent’s group at the University of Toronto, is collodial quantum dots. “Colloidal Quantum Dots are semiconductor nanoparticles that are suspended in the solution phase. Because the nanoparticles are so small, they cannot be seen by eye, but they do make the solution look black, much like an ink. When you have materials like this, you can allow your imagination to run wild with respect to how you want to deposit them into a film — ink-jet printing, slot-dye coating, or through a spraying method. We played with both the ink solution and the spray droplet size to arrive at a scenario where the colloidal quantum dots were ‘almost dry’ by the time the spray reached the substrate,” Kramer told EE Times. Industrial systems often need to be certified to a specific Safety Integrity Level (SIL) in order to be acceptable to the end user. But pursuing such a certification can be a time-consuming and expensive task. Now vendors are beginning to offer pre-certification kits to ease the system developer’s final certification task. What are being called the first of such prepackaged safety-critical pre-certification kits are coming from the joint efforts of the RTOS vendor Micrium and the consulting firm Embedded Office. The Cert-Kits cover Micrium’s µC/OS-II RTOS when running on one of several CPU cores, both with and without memory protection units. They contain the certified source code, various software manuals, validation software, and the TUV certificate for the type approval. Kits are available for IEC61508 certification of industrial designs to SIL-3, IEC62340 certification for medical applications through Class C, and EN51208 certification for railway systems through to SIL-4. Silego’s CurrentPAK high-performance load switches boast efficient, high-accuracy current measurement coupled with a variety of advanced programmable features. For example, Silego just announced a new family of configurable mixed-signal ICs under the CurrentPAK banner. These high-performance load switches boast efficient, highly accurate current measurement coupled with a variety of advanced programmable features. The first device in the CurrentPAK family, the SLG6M6001V, is offered in a 2.0 x 3.0mm, fully encapsulated plastic package. The SLG6M6001V boasts a current rating of 10 amps continuous coupled with an ultra-low RDSON value of only 3.8 mΩ. Using nonvolatile memory, designers can program multiple aspects of the device, including enable logic, slew rate, current limiting, overtemperature protection, and integrated discharge rate. FPRF chips have the potential to revolutionize RF. First, Lime Microsystems confirmed the rumor that its new dual transceiver device, the LMS7002M, will sample at $110. That is the original price of the first-generation single transceiver — so it’s twice the capability for the same price. The technical innovation is that the second-generation FPRF spans the frequency range from 100 kHz to 3.8 GHz. This amazing range covers everything from legacy systems such as Project 25 (P25) and Tetra to all the cellular bands and beyond. I was intrigued to find out more, so I called the company. It seems that the “secret sauce” is to deploy the user programmable DSP included on the chip. Combined with the phase-locked loops, this affords the chip its very impressive frequency range. The original LMS6002D pops up in a wide range of applications. The conclusion: The integrated data converters are competitive with discrete devices. So if you need, say, an ADC, DAC, and some baseband filtering, you should consider using one of these RF chips. The Compact Model Coalition has released a variety of new models for SOI devices and announced plans for work on GaN HEMT Spice model standards. This year the Compact Model Coalition (CMC) — formerly known as the Compact Model Council — is introducing new standards and making model codes of several existing standards available to the public. New models called BSIM-IMG and HiSIM-SOTB were developed for extremely thin-body SOI CMOS (ETSOI) and will enhance the popular BSIM and HiSIM standards platforms. This technology is gaining significance as an option for advanced, scaled CMOS. Intel, which has its own developer conference, was there encouraging developers to be cross-platform — not just Android-specific. In his keynote, Jeff McVeigh, the general manager of performance client and visual computing within Intel’s Developer Products Division, stressed multi-platform awareness is key to reaching full breadth of your audience. Open-source collaboration and projects go hand-in-hand with an increase in freelancers, since individuals can gain new skills, or improve on already existing skills through collaborative projects, such as open-source design for embedded systems, independently from being full-time at any individual company. On the assumption that missing Internet of Things (IoT) standards are developed over the next several years IC Insights forecasts that web-connected things will account for 85 percent of 29.5 billion Internet connections worldwide by 2020. At the level of the ICs, discrete and sensor semiconductors that go into connectivity and sensor subsystems IC Insights reckons the value was $3.9 billion in 2014. This is set to grow by 19 percent in 2015 to $5.6 billion and rise to $11.5 billion in 2018 representing a CAGR of 24.3 percent over the period 2013 to 2018. The annual growth figure for 2015 is considerably lower than that provided by another market forecaster Gartner Inc. Automotive V2X, LED lighting and smart domestic objects are set to drive semiconductor market growth through the year 2020, according to market analysis firm Gartner. Gartner is predicting a 30 percent compound annual growth rate for the IoT chip market for the period 2013 to 2020. The startup NanoLambda has developed a $10 spectrometer-on-a-chip that’s suitable for use on a wide range of consumer devices. The Spectrum Sensor measures individual wavelengths and is accurate to 1 nm with 10nm resolution, allowing NanoLambda to selectively pass light through nanostructures to determine their makeup. The company used traditional wafer processes to create 5mm x 5 mm x 2mm thin nanofilter arrays. Nine hundred of these arrays can be stacked to create a millimeter-scale chip that can be embedded into various Internet of Things devices. “Every material has its own spectral fingerprint, which means, when certain very flat white light shines on to the target material, its material absorbs light differently, making… specific patterns or shapes,” NanoLambda CEO Bill Choi told us. “Each filter will detect different wavelengths. Then, collectively, the sensor can figure out” the material’s characteristics. Researchers at Brookhaven National Laboratory have not solved the room-temperature superconductivity problem, but they have proven that a new material exhibits superconductivity in a new way, which they think may lead to cracking the secret to room-temperature superconductivity. Once understood, engineers will be able to create “designer” materials that are compatible with CMOS and yet superconduct at room temperature. German component of the market grew in the third quarter. Distributor organization FBDi reported six per cent rise. When Germany is Europe’s largest market area, the figure bodes well for the entire region. FBDi now expects that the current year growth recorded as 6-7 percent. The result is excellent in a situation where price competition is hard and in many sectors, the production of oversupply. Semiconductors are the sum of EUR 510 million, or more than two-thirds. We keep hearing about the revolutionary properties of graphene, an atom-thick sheet of carbon whose physical characteristics hold a great deal of promise — if we can figure out good ways to produce it and use it. The New Yorker has a lengthy profile of graphene and its discoverer, Andre Geim, as well as one of the physicists leading a big chunk of the bleeding-edge graphene research, James Tour. ntel has spent years trying to get inside the mobile phones. The project has cost the company billions and billions of dollars. A little ironic is that the company could today be Qualcomm’s location. If it had agreed to manufacture processors Apple’s iPhones. Former general manager of Intel’s Paul Otellini revealed last year interview that Steve Jobs asked Intel is manufacturing the iPhone processors. This was around the year 2005, at a time when Apple announced the transfer to your PC x86-time. Otellin thought that Apple was not attractive. Will Qualcomm’s China Investment Gambit Pay Off? Qualcomm is vulnerable in China, and the company knows it. It remains to be seen, however, how the company’s $150 million public relations gambit to invest in China’s mobile ecosystem will actually help diffuse alleged accusations of Qualcomm’s monopolistic behavior in China. Following the $4 billion all-stock 50%-split Cypress-Spansion merger, CEO T.J. Rodgers will head the new company under the global name Cypress. The company will keep Spansion’s world leadership in NOR Flash memory and retain Cypress’s huge SRAM memory market. Even if both companies were already present individually in the automotive market, Rodgers explained that, though Cypress tends to address embedded system solutions in the cockpit, with touchscreen interfaces, Spansion’s products find their way into car engine management. Photonics now run through cables, ICs, backplanes, and circuit boards. We keep hearing that copper has reached its speed limit, and that optics will replace copper for high-speed signals. We’ve also heard that active optical cables can replace copper in links between switches, routers, and servers. Furthermore, silicon chips can now have some optical components. But that still leaves circuit boards — or does it? Enter electro-optical printed circuits, which combine copper and optical paths on the same board. 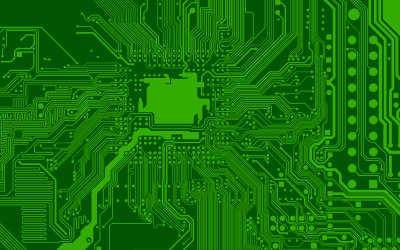 Electro-optical PCBs use copper for distributing power and low-speed data, and optical paths for high-speed signals. Pitwon noted that crosstalk, skin effect, and skew degrade signal integrity in copper systems at high frequencies. Optical signals, he explained, don’t have those issues, and they have greater channel density than copper. He also claimed that optical signals could consume lower power than electrical signals, because they don’t need equalization and other signal conditioning. Optical signals could also reduce the number of layers on a board by 50% and surface area by 20%. Optical technology is migrating to the backplane and to connectors. Optical technology, in the form of SFP and QSFP interfaces, has been around for some time, but, according to Pilwon, “We’ve developed optical backplanes and optical backplane connectors that include the optical transceiver at the connecting edge” (Figure 1). Furthermore, optics can appear within a board, not just at the edge. That means the optics can move closer to the electrical signal source — the processor. Waveguides and fiber optic patch cords can be manufactured on a board. Pilwon said that optical backplane connectors have been developed, as well as a technique to align the small waveguides to transceivers on the board. The next challenge is to develop waveguides on to boards where the tight bends don’t degrade performance to unacceptable levels. Using film processing and photolithography techniques, engineers fabricated flexible optical waveguides, which can move light around components on a board. The requirements for the build were to have the waveguides with walls at least 100 μm thick, with a bend radius less than 5 mm. Those requirements were needed to get the waveguides into connectors, letting light travel between a backplane and a linecard without the need to convert to an electrical signal. The waveguides were constructed using two different techniques: non-contact mask lithography or direct laser writing. a technical overview of the liquid-crystal polymer (LCP) printed circuit technology developed by HSIO Technologies. -Extreme increases in data traffic driven by internet, streaming video, smart phone, tablet and cloud computing are driving need for significant increases in bandwidth. -Increases in data rate and functionality are driving significant wide scale architecture evolution. -Advances in semiconductor packaging are driving significant density and routing challenges. -Power and thermal management pose challenges in low-voltage systems to preserve battery life. -Advances in semiconductor geometries have outpaced printed circuit geometries. In many ways, the printed circuit industry has been driven by the mobile and handset market to achieve finer lines and spaces with higher density. The domestic circuit market has adopted laser direct-imaging systems and laser-drilled microvias over the last several years as advancements in fabrication techniques. In general, domestic suppliers can supply 75-micron lines and spaces with multi-layer construction, with the availability of 50-micron lines and spaces in some cases. The supplier pool is dramatically reduced below 50-micron lines and spaces, with blind and buried vias likely required. The development focus started with an improvement in material used to build the circuit stack. Liquid crystal polymer (LCP) is used widely in the connector industry which is another area of HSIO expertise, but mostly in an injection-molded construction. We’ve all been to the trade shows where semiconductor vendors are showing their motor control solutions running a motor with a simple flag or disc to show that the motor is actually moving (I’m guilty myself!). Of course, unless you are building a simple fan with a very small blade, this is not representative of a real application at all, is it? So, how can you go about testing your control capability across the operational range (+/- torque generation) and with various loads (+/- load)? One very simple way is to use the 2MTR-DYNO (InstaSPIN-FOC™ evaluation module from Texas Instruments (TI). This kit includes two identical low-voltage (< 60V) NEMA23 framed synchronous servo motors, each with an integrated 4,000 counts per revolution single ended encoder. The motor shafts can be connected to each other using the included shaft coupler, and the aluminum frame mount increases stability during testing. The idea is that one of the motors can be controlled as an active load, while the other operates as your motor under test. any three phase motor control system can be create — and actually tested — in no time at all. At IEDM 2014, IBM claims that for PCM, non-volatility/data-retention is no longer essential. Ron Neale takes a close look. In its invited paper [Ref 1] at IEDM 2014, IBM offers a headline-grabbing position: For PCM, non-volatility/data-retention is no longer essential. It might cause many PCM developers, who for a long time have been struggling with the problem, to breathe a sigh of relief, albeit perhaps short lived in the light of what follows. As always the devil is in the detail, and, in this case, it was for the application of PCM (pulse-code modulation) to SCM (storage-class memory). The problem is the growth of processor parallelism while system memory latency is remaining roughly constant. The solution to the problem of servicing the multiple fetches from system memory is to add more DRAM. This increased cost of adding more DRAM in order to maintain bandwidth is imposing an unacceptable cost burden, so this could open an opportunity for PCM. The proposition in the paper is that for PCM in an SCM role, long-term non-volatility is not essential. Superconductors are in the news again. This time, the Massachusetts Institute of Technology (MIT) has discovered a law governing thin-film superconductors, eliminating much of the trial and error for companies that manufacture superconducting photodetectors that can sense single photons and squids for super-accurate measurements of minute magnetic fields. “The applications for thin-film superconductors today are squids, photodetectors, voltage standards, metrology, and D-Wave’s quantum computer,” EE professor Karl Berggren told EE Times. He was assisted by Yachin Ivry, a postdoc in MIT’s Research Laboratory of Electronics. Today making thin-film superconductors involves a lot of trial and error, because there are no formulas that relate the different parameters. But with MIT’s new mathematical law, new superconducting chips can be designed with the correct parameters determined ahead of time with his and Ivry’s formula. Mouser Electronics, Inc. announced the availability of Molex EdgeMate™ power connectors featuring positive lock design that offers strong PCB-to-connector retention and polarized crimp terminal to ensure correct terminal orientation and insertion. The Molex EdgeMate Power Connectors, available from Mouser Electronics, can handle 250V and 7A while meeting UL94-V2 flammability requirements. Unlike similar solutions, Molex EdgeMate power connectors feature a polarized housing that ensures correct orientation with the PCB. Component manufacturers are continually developing new and smaller packages for components that are mere fractions of a millimeter and have board to component clearances of less than a mil. Pick and place machines have new accessories that allow placement of these almost invisible parts. Components are placed extremely close together. How do you effectively clean under something so small? No-lead solder is a relatively recent legislated fact of life that necessitated new solder, new fluxes, higher temperatures, and new solder processing equipment. Many new approaches, alloys, chemicals, and soldering processes have been developed to address these issues. Tin whisker problems also increased dramatically. Time-delayed effects, however, often will not show up until a product is out the door and has been in service for even a year or two. The pace of product development covers up some of these time-delayed issues when products are routinely discarded for newer models. For products such as mobile phones, problems don’t often show up because comparatively few people are using a mobile phone that is more than 2-3 years old. Transistor process engineers are engaged in a constant struggle trying to overcome the thermal barriers that prevent the full achievement of the intrinsic performance potential of gallium nitride (GaN) semiconductors. Recently, a synthetic diamond substrate, has come on the scene as a solution to this challenge by replacing GaN’s entire host substrate—usually made of silicon (Si) or silicon carbide (SiC) and offering great potential for the near future. The biggest cause of electronic circuitry and IC failure is heat. Chemical vapor deposition (CVD) diamonds, mastered by a company called Element Six, are three to 10 times better than copper, SiC, or aluminum in conducting heat. GaN-on-diamond substrates are in production. Companies like Triquint have developed RF Power Amplifiers (RFPA) with GaN-on-diamond to be used in radar, satellite communications, and cellular base stations. Synthetic diamond is now being tested for quantum-based applications such as secure quantum communication, quantum computing, and magnetic/electric field sensing. Quantum applications use the exciting world of quantum physics to perform operations, which would not be possible in systems adhering to classical physics. Synthetic diamond has significant advantages over competitive materials because the quantum properties of the defects it hosts can be manipulated and probed at room temperature. The latest member of the Flexor line of software-radio FMC (FPGA Mezzanine Card) modules from Pentek, the Model 3316 doubles the existing channel density for a single slot, while boosting sample rates through the incorporation of eight 250-MHz, 16-bit ADCs. Additionally, the module offers programmable timing and multiboard synchronization to enable the deployment of large high-channel-count systems. Prices for the Flexor Model 3316 FMC start at $3495 when purchased with the Model 5973 FMC carrier. Some of the latest stretchable electronics are bringing the Internet of Things to health and safety products, and enabling a whole new world of medical and health monitoring, and not just for professional or Olympic athletes. Report suggests TSMC just can’t satisfy Cook & Co.
Apple and Samsung have fought bitterly in the courtroom when it came to patents, but the two firms are still prepared to do business: namely the buying and selling of chips. Earlier this year, Apple reportedly decided to drop Samsung as its manufacturer of A-Series system-on-chip processors used in iPads and iPhones. Instead, Apple, which designs the silicon, gave the supplier contract to Taiwan Semiconductor Manufacturing Company (TSMC). But on Monday Korea Times reports that Apple has signed a deal with Samsung to supply 80 per cent of its SoC processors, a deal worth billions of dollars to the chaebol. “Apple has designated Samsung as the primary supplier of its next A-series chips powering iOS devices from 2016 as the alliance with GlobalFoundries enabled Samsung to cut off capacity risk,” a source told the newspaper. The source said the 14nm chips will be produced by Samsung’s Chinese fab in Giheung-gu and its US fab in Austin, with Global Foundries producing chips in its New York facility. TSMC isn’t totally out of the running, however, since the source said 20 per cent of Apple’s application processors would come from the Taiwanese firm. These will be 16nm chips, compared to the smaller and more power-efficient Samsung processors. The cloud offers a variety of benefits to organizations, from flexibility to cost savings. For electronics OEMs, it’s the latest supply chain used by customers to get the servers and storage they need to run their businesses — a fundamental shift in how organizations buy IT. There’s an app for that. That’s long been the joke amongst smartphone toting consumers. More and more, the same can be said for supply chain management and logistics tasks. Managing sales and operations planning (S&OP) in a formalized way can put an electronics OEM at the head of the pack, and lead to a good year-end sales report. That’s the gift that keeps on giving during the holiday season. Although accurate forecasting leads to myriad benefits, getting there can make even the most sophisticated organization feel less than merry. In fact, one in five organizations tags S&OP processes as the single most significant opportunity for improvement, according to research by E2Open. True three-dimensional (3-D) chips were demonstrated recently at the 2014 International Electron Devices Meeting (IEDM, Dec. 13-17, San Francisco) by Stanford University. Most 3-D chips use through-silicon-vias (TSVs) to stack separately manufactured dies, such as the Hybrid Memory Cube, which stacks DRAM die by Micron Technology, Inc., of Boise, Idaho. A startup — BeSang Inc. of Beaverton, Ore. — has licensed its proprietary process to SK Hynix Inc. of Icheon, South Korea, for building true 3-D chips without TSVs. But Stanford’s demonstration showed that any fab can stack any number of layers of logic and memory atop a standard complementary metal oxide semiconductor (CMOS) die. For the demonstration, Stanford stacked a standard CMOS chip atop two layers of metal-oxide resistive random access memories (RRAM) and a top layer of logic circuitry using carbon-nanotubes as the transistor channel. There’s still a lot of life in Moore’s Law and a lot of smart people driving it forward and putting it to good use. That was my big takeaway from the 2014 International Electron Devices Meeting. IEDM was a victory lap for Intel, which gave more details on the 14 nm finFET process it first described in September. IBM chomped at its heels, describing its own 14 nm finFET process optimized for its embedded DRAM. Separately, TSMC gave a first, albeit somewhat limited, look at its improved 16 nm+ finFET process. Two of its customers — Avago and Renesas — gave the first public descriptions of prototype devices made in it. Samsung presented eight papers but none that described its 14 nm process. The event put to rest any doubt finFETs are the way forward for the bulk of the industry. STMicroelectronics was the lone voice advocating a planar silicon-on-insulator alternative. Other than Samsung, no one else delivered papers on 3D NAND flash. All its competitors are probably working on it but are too close — or far away — to reveal their exact status. Likewise, IEDM veterans thought they would have seen more papers on topics such as tunnel FETs and III-V materials that could be key for the 10 nm node and beyond. The lack of papers suggests rivals such as Intel, IBM, Samsung, and TSMC may be in the late stages of finding their secret recipes. Xilinx says it took to deliver volumes of 20-nanometer process produced Kintex-series FPGA circuits. At the same time Xilinx is the first to take this process a dense mass production. The first 20 nanometers volumes reach the circuit is Intex Ultrascale KU040. At electronica 2014, Bosch CEO Stefan Finkbeiner discussed the latest intelligent sensors and how they can be used in smartphones, IoT, and more. Bosch’s BME280 sensor measures pressure, temperature, and humidity, which is useful for smartphones and buildings. And the tiny BMA355 accelerometer and the BMI160 low power IMU can find use in wearable devices. A new solution from Keysight reduces system complexity and saves time for engineers designing and implementing high-power systems. The N8900 Series prewired rack system for high-power DC applications is made up of 15 kW blocks that can deliver up to 90 kW and up to 3060 amps. Internal communications allow the system to operate as a single power supply and users can communicate via LAN, USB, or GPIB interfaces. Editor’s note: Low power IC solutions are in great demand with the rapid advancement of handheld devices, wearables, smart cards and the IoT bringing a massive amount of new products to market that all have the same primary need: Powering the device as long as possible between the need to re-charge the batteries. Ambiq Micro came on the scene four years ago with the goal of creating ultra-low power semiconductor solutions like microcontrollers, real-time clocks, and advanced power management. This white paper shows a 40 year old revived, innovative technique they use in the design of their ICs. While reducing energy consumption is critically important throughout the electronics industry, the question is: how should that goal be achieved? Ambiq Micro’s approach moves beyond the incremental improvements that other semiconductor companies have taken and makes revolutionary advances through a unique approach to the problem: sub-threshold circuit design. Traditional digital designs use the transistor state – “on” or “off” – as a critical concept for implementing logic. Analog designs likewise assume that a transistor is “on” to some controlled degree, using it for amplification. But sub-threshold operation means that none of the voltages in the chip rise above the threshold voltage (Vth), so the transistors never turn on. Even a logic “high” voltage keeps the transistors “off.” This means that completely new design approaches are required. Sub-threshold design isn’t a new concept. As far back as the 1970s, Swiss watchmakers noticed the potential of operating select transistors in the sub-threshold regime. The idea was picked up for pacemakers and RFID tags, but never saw much acceptance beyond that. After a lull that lasted a couple of decades, the topic regained some academic status in the late 1990s and early 2000s. By that time, the upcoming primacy of energy consumption was evident, and research started into ways that commercial circuit designers could reduce energy consumption. Sub-threshold design techniques were among those ideas. It would be obvious to ask why, if this technology was developed in the 70s, it never caught on. The answer to that question is, “Because it’s not so easy.” There is no fatal flaw, but the transition from super-threshold techniques has not been trivial. Adapting the standard super-threshold flows and infrastructure for sub-threshold design presents numerous detailed challenges. These start with the very transistors themselves. The output response of a transistor in the sub-threshold regime is subtle; detecting it requires great sensitivity. Currents change exponentially in response to changing voltages, but they’re exceedingly small currents. Sub-threshold designs are also far more susceptible to process and environmental variation than are super-threshold designs. For example, the current in a slow process corner can be 10-100 times less than that for a nominal process. Given that the on/off current ratio (above) is only on the order of a thousand, this cannot be ignored. The development of Ambiq’s SPOT technology, which addresses all of these challenges, has been a multi-year effort involving multi-faceted solutions, starting with a better understanding of the transistors themselves.